Along with the Indonesian Dentists Association (PDGI), the West Jakarta Health Dept. is holding a dental and oral health service at Tambora Flat, Angke. It is participated by 400 children and 200 adults.
" 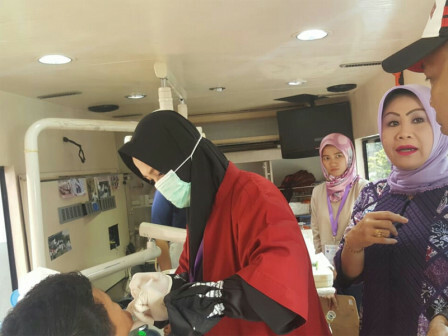 The enthusiasm of the residents to check up their teeth and mouth is very high"
West Jakarta Health Sub-dept. Head, Weningtyas Purnomo Rini expressed that it is held for free and aimed to improve the flat residents' health and strength the silaturahmi. "The enthusiasm of the residents to check up their teeth and mouth is very high," she expressed. Even, similar service is also held at the Angke Puskesmas. "So the flat residents can also visit to the puskesmas," she stated.